THIS EVENT IS SOLD OUT! Join the Harvard Club of Southern California at the Los Angeles Opera for this very special performance of Giacomo Puccini's Tosca. Also attend an optional pre-performance lecture about the opera 1 hour prior. Limited tickets! A fiery prima donna is forced to play a role she never imagined when she becomes trapped between her allegiance to her rebel lover and the scheming of a treacherous police chief who will stop at nothing in his lust for her. The explosive conflict between these three unforgettable characters comes to a hair-raising conclusion in one of opera's bloodiest, most intense dramas. 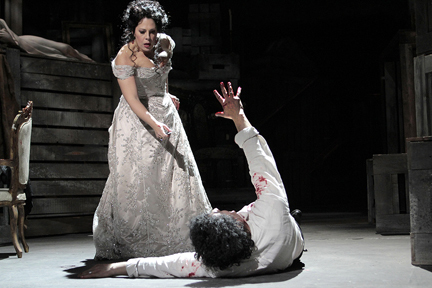 The electrifying Sondra Radvanovsky returns to reprise her acclaimed portrayal as Tosca in a revival of the thrilling John Caird staging, conducted by James Conlon. This event is sold out! Thanks for a great response.